Napa, Calif.—A new survey of top wine drinkers contradicts industry assertions that most wine is drunk with food. The study of high-frequency wine drinkers by Wine Opinions reports that while an average of 41% of wine is consumed with meals, the majority—59% —is not, at least among avid wine drinkers. The average respondent reported that frequent consumers drink one-quarter (26%) of the wine they consume without food. They also drink a significant amount while preparing a meal (14%) or with appetizers or snacks (19%). Thus (on average), the majority of wine is consumed away from the table. The chart above shows the distribution of respondents by what percentage of their wine they consume without food of any kind. Among generational segments, older respondents drink the largest proportion of their wine with a meal (65 year olds and older averaged 50%), with each younger segment drinking a bit more without food. The proportion of wine drunk without food was highest among females (29% vs. 25% of males) and younger respondents (31% of Millennials). As would be expected, more wine is drunk on weekends than during the week, with about half consumed on Friday and Saturday (24% and 28%). Only one-third of the wine is consumed Monday through Thursday. Less wine is consumed on Sunday (16%), although that is still twice as much as on the average weekday. During the weekend, the largest portion of wine (42%) is consumed on the weekends with dinner. An additional quarter is drunk both before dinner (24%) and after dinner (23%). Very little wine is consumed during weekend brunches/lunches (4%) or in the afternoon (7%). The survey also asked the same questions about on-premise consumption. 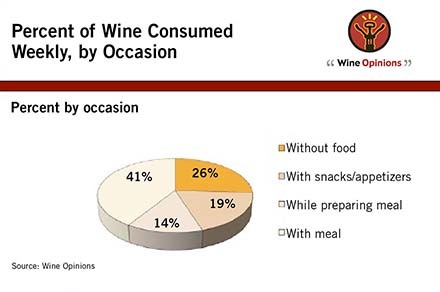 The highest consumption was with the meal (58%), 19% when seated before a meal, followed by “when waiting in the bar/lounge” (12%), and “after a meal” (11%). The survey respondents also report that wine accounts for half (51%) of their alcohol consumption in bars and lounges, which probably reflects the high interest in wine among the Wine Opinions consumer panel. Beer and spirits each account for about one-fifth of the beverage consumed in bars and lounges. The rest is nonalcoholic beverages. In other findings, the report noted that high-frequency consumers are less concerned with food/wine pairings than the industry assumes. Sizeable minorities, however, felt some types of wines don’t taste good without food (41%) or seldom have wine without food (30%). The feeling that certain wines do not taste good without food increased with age. Millennials were least likely to agree (30%) and those 65 and older most likely to agree (50%). Younger respondents were the least likely to agree that they seldom had wine without food compared to older respondents (21% of Millennials and 22% of Gen Xers vs. 37% of Baby Boomers and 32% of those 65-plus). In addition, 35% have a drink before going out in the evening and 55% drink wine in casual non-meal get-togethers with friends in a home. The latter statistic is distinctly skewed toward younger consumers, and is particularly strong for Millennials (74%). And surprisingly, while white wine has been regarded as the preferred type for aperitif or “cocktail” purposes, only 25% reported preferring white wine to red wine without food. The report was based on almost 800 responses from the 5,500-person Wine Opinions consumer panel of the segment of U.S. wine drinkers who are the most frequent purchasers and consumers of wine. According to the Wine Market Council national survey of wine consumers conducted in 2010, 9% of U.S. wine drinkers drink wine on a daily basis and 29% drink wine on average several times per week. By contrast, 29% of the members of the Wine Opinions panel drink wine daily, and 54% drink wine several times per week. Wine Market Council’s 2010 consumer study shows that there are 29.3 million daily and several-times-per-week wine drinkers in the U.S. (out of a total of 77 million wine drinkers). The Wine Opinions Panel is primarily recruited from this group, which accounts for more than 82% of total wine sales in the U.S. and an even higher percentage of the purchase of wines selling for $15 or more. The report—Core Track Volume 6—presents the results of a survey of the Wine Opinions consumer panel and focuses on wine preferences and sales by price-point and appellation in both the on- and off-premise sectors. The study confirms that the trade-down trend from expensive wines continued in 2010, but also that high-end consumers are stabilizing their purchases of $20 to $30 wines. “The market was extremely volatile in 2010,” notes Christian Miller, the research director of Wine Opinions. The Core Track Volume 6 report is available on the Wine Opinions site at wineopinions.com. The cost of the 44-page report is $495. For information contact John Gillespie at (707) 815-9463 or jgillespie@wineopinions.com.